Day 1: Arrive Entebbe Airport. Basic- Central Inn Entebbe Moderate – 2 Friends hotel Entebbe Luxury – Protea Entebbe. In the morning right after breakfast, you will drive to transfer to the Landing Site near the zoo to catch your onward Boat to Ngamba Island. Transfer to the Ngamba- 1 an dhalf hours to arrive in tieme for feeding the chimpanzees. Learn about the island and then later return to the main land. Moderate – Imperial Royale Hotel or Cassia Lodge. Luxury – Kampala Serena Hotel. At 7am you will be picked up from the hotel to transfer to Murchison Falls National park. The dive takes 6 hours arriving in the afternoon. On the way to the aprk you will visit the rhino sanctuary and then drive to arrive later in the afternoon. Lunch will be enroute and the gudie will advise according to the time. Latr in the afternoon go visit the top of the falls, to have an aerial view of the Nile as it forces its self through a narrow gorge. Moderate – Fort Murchison or Murchison River Lodge. Luxury- Paraa safari lodge or Chobe safari Lodge. Day 5: Transfer to Fort Portal. BLD Long Drive. Flight option available at USD 470 per person per way. Moderate- Mountains of the moon hotel or Crater Safari lodge. Day 6: Kibale Forest Chimpanzee tracking/ Bigodi walk in the afternoon. At 6:30am after breakfast, drive to transfer to the Kanyankyu tourist centre where you will be briefed before Chimpanzee Tracking. 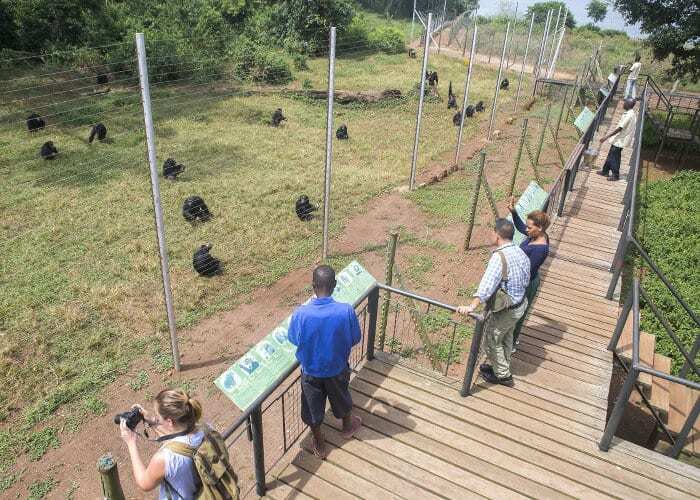 Kibale forest has a large number of about 13 primate species including the grey mangabeys, uncommon L’Hoest, pottos, red Colobus monkey, baboons, blue monkey, bush babies and black faced vervet monkeys, among others. A series of shady trails offers great to delight to botanists as well as butterfly lovers. Whereas birders will have a lot to enjoy of the 335 bird species. Other wildlife here includes buffaloes, giant forest hogs and various antelope species. Return to the lodge for lunch before going for a nature walk in Bigodi swamp. After breakfast, you will depart the hotel at 10am to transfer to Queen Elizabeth national aprk arriving in the afternoon. Check into your hotel to have lunch and then relax. Visiting the salt mines USD 20 per person. Take a safari trip or ride through the Kasenyi area of Queen Elizabeth national park for chances to spot lots of lions, hyenas, elephants, buffaloes and many more. Later in the afternoon you will go for a boat cruise on the Kazinga channel. Also referred to as the birders paradise. Not only does the ride reward you with wildlife at the shores but also plenty of birds. This is another bird watching safari of its own. The boat ride takes 3 hours and you should be back in time to watch the sunset. Overnight at your previous lodge. Moderate – Gorilla safari lodge, Gorilla mist camp or Nkuringo cottages. Luxury – Gorilla forest camp or Clouds Lodge. Today is the D-day that we all have been waiting for. The day starts with an early breakfast and then you will transfer to the briefing point. After briefing you will have been allocated a gorilla family and along the different trails you will start the search for the gorillas. 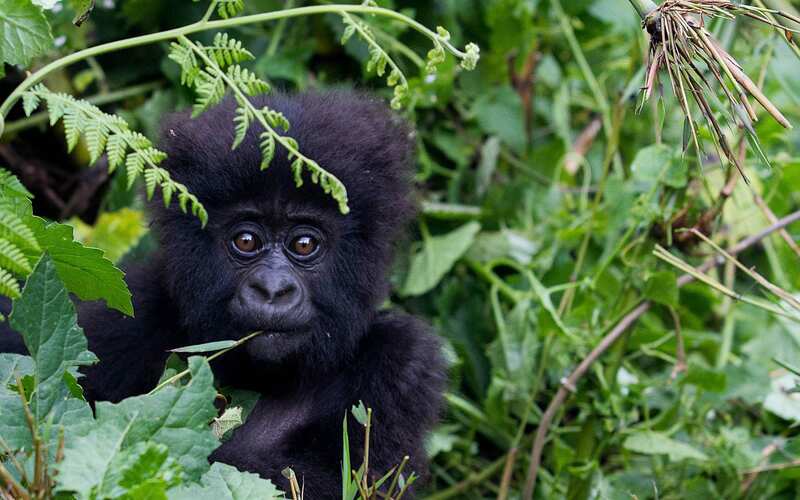 The actual trekking starts at 8am and through the forest a guided walk as you search for the gorillas. Gorilla trek time ranges between 2 to 8 hours and therefore we recommend that you carry water and packed lunch incase the gorillas move further. On meeting the gorillas, you ill spend 1 hour following them and then later transfer back to your hotel. Overnight at the previous lodge. Day 12: Transfer to Lake Mburo Park . Afternoon Game drive. At 7am, you will embark on the 4 to 5 hours journey to Lake Mburo National park. 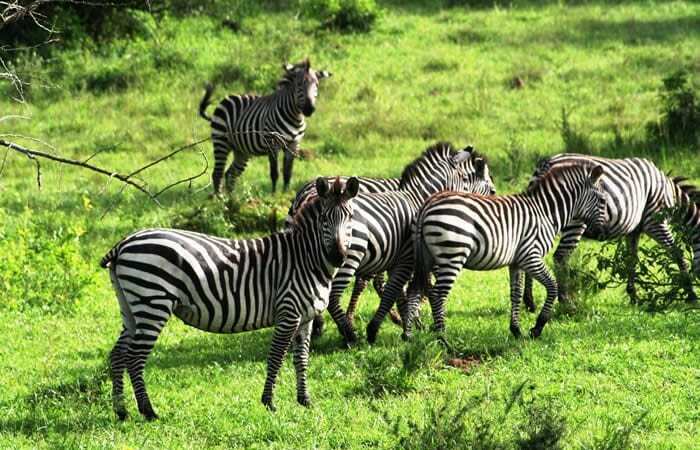 The home of the zebras in western Uganda. Arrive in time for lunch to have lunch and then later relax as you prepare to go for a spot light game drive to search for leopards. Day 13: Early Morning Guided nature walk. / Afternoon Boat ride. Go for a guided nature walk in the park this morning and then later in the afternoon you will go for a boat ride on Lake Mburo.. Overnight at previous lodge. At 7am you will depart , Lake Mburo national park to transfer to Kampala. The drive will take 3 hours. Drive to proceed to Entebbe and go for a nature walk I the Botanical gardens. Later on you will transfer to the airport to catch your onward flight.